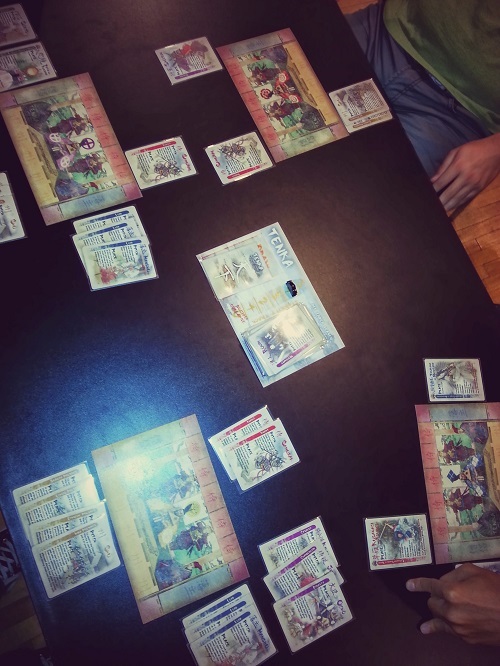 Tenka (Victory Point Games) by Scott Muldoon is a card game which is set in Medieval Japan in which 3 to 4 players vie to take control of the country by holding a number of provinces. While they will only be able to play one card per turn (with one exception), the choices of what card to play and how will be a hard one to take since each card can be used in two fashion. As the game progresses and the victory condition gets easier and easier, who will be the one to grab victory before the whole country falls into chaos is the one who can best execute his plan with limited resources. The game is made up of 80 cards, although only 67 will be used in the game. It also comes with 6 player mats, a central mat and a Control marker, which is used to indicate the current number of provinces needed for a victory. Tenka: Aren’t these cards gorgeous? The deck is broken down into 4 basic types of cards: 13 Priest cards, 13 Lord cards, 13 Samurai cards and 13 Province cards. 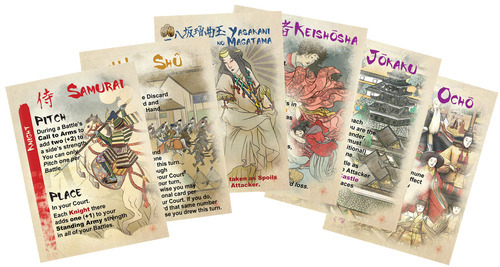 All cards of a types are the same: there is no difference between the Samurai cards or between the Province cards. Added to this are 3 Regalia cards, which act as “double” version of the base cards and can be used to win the game if a player has all three of them in their tableau. There are also 25 special cards, which are all different, and out of which only 12 will be used in the game. The materials are gorgeous, easily some of the best VPG has done so far and a much needed improvement over the first edition. The cards are still not quite up to card-game standard, being printed on heavy cardstock with rounded corners, but once sleeved, they are more than up to the task. Check for victory: if you have the most Provinces and you have more Provinces than the current Stability number or you have all 3 Regalia cards in your court (tableau), you win. Draw one card, plus 1 more card per Province cards you have in your court and plus 1 card if you have the most Priests in your tableau. Keep only 1 card from those drawn, 2 if you have the most Priests. Do 1 action (or 2 if you have the most Lords in your court) from the following list: pitch a card; place a card; attack; pass. Province cards, apart from being a victory condition, when Pitched allow you to search the discard pile and put a card in your hand. When Placed, allow you to do one more action. At the start of your turn, for every Province card you have in your court, you get to draw one more card, from which you will chose to keep one. Priest cards when Pitched allow you to draw a card at random from another player’s hand and put it in your hand. When Placed, the card allow you, if you have the most Priests at the start of your turn, to draw an additional card and keep two cards instead of just the one. Samurai cards, when Pitched during a battle, add +2 to the strength of the Army they support. When Placed, they add +1 to the Standing Army’s strength. More on Army strength and battles later. Lord cards, when Pitched, forces a player to remove a card of their choice from their court. When Placed, if you have more Lords in your court at the start of your turn, the card allows you to take two actions instead of just one. In other words, Pitching a card allows you to have an effect right now, while a Placed card gives you a long term effect. Which one is better? it all depends on the timing. Note as well that a tie for most Lords or Priests means that no one gets the effect, just like being tied with the most Provinces means that the game goes on. In addition, there are 3 Regalia cards that can only be placed and that are the equivalent of 2 Lords, Priests or Samurai, depending on the exact Regalia. The 12 (of 25) special cards all have specific powers and thus can change the game quite a bit. They mostly have either a Pitch or a Place effect, and as such need some planning before you can use them. So, to Pitch or Place a card, simply follow the effect on the card. The 3rd action, Attack, also needs the use of a card, but this time it can be any card. 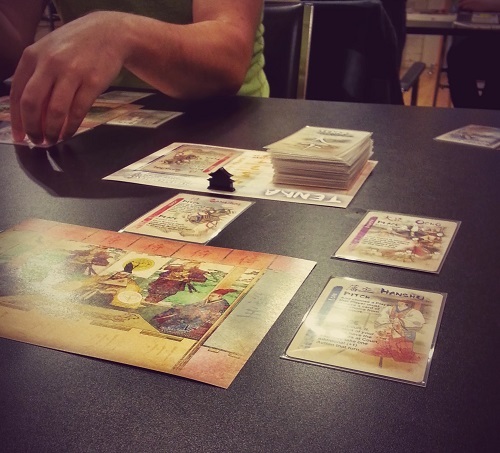 To attack, a player simply indicates his target, pitches any card from his hand and then compares Standing Army strength of the two players. Each Samurai is worth 1 point and the Samurai Regalia being worth 2. Once the strength have been calculated, each player, starting with the Attacker, can Pitch 1 Samurai from his hand, which adds 2 points to his Standing Army. Each player not involved in the battle can now Pitch 1 Samurai to add +2 to either army, with the Defending player acting last. Add up all the Strength points and the highest total wins, with ties having no winner. The loser of the battle must discard the difference between his score and the score of the winner, with any extra loses coming from his court. If the winner was the defender, the battle is over. If the winner was the attacker, they get to either take: Spoils, which is one of the cards that were discarded as casualties by the loser or one Regalia from his court and put it in his hand; Conquer, which allows the player to take one Province from the loser’s court and place it directly in his court. As the game progresses, the draw deck will become depleted. When this happens, take all the discarded cards and re-shuffle them and lower the Stability number by 1 and all players must discard one card from their court. The Stability number is the number of Provinces needed to win the game and it will go from 5 at the start of the game towards 2, just before the game devolves into chaos, ie, the game is over. If no one wins before then, the players count up the number of cards in their court and the winner is the one who has the most cards. I really like this game. The simplicity of the rules belies the complex decisions and ramifications of said decisions: since you check for victory at the start of you turn, it is tricky to decide just when to go for a win or when to strike out since other players will make sure to attack you when you’re in a position to win. Add to this the difference in effect of placing a card in your court vs pitching the card and you have a very tricky game. I really like the idea of making the player draw multiple cards but only allowing to keep 1 or maybe 2 cards. It allows the player to plan ahead instead of simply relying on the luck of the draw and it’s another hard decision to take. Combat is simple enough but can be bloody, almost destroying a player and leaving him with very little to draw on. On the other hand, being on the attack isn’t always a good thing, since the fortunes of war can change quickly. Add to this another difficult decision on what to take as the spoils of war and you have a game that can easily go in any direction. The way the victory condition keeps on getting easier also makes for an interesting dynamic, as the game will get to the point that most players will have 2-3 Provinces in front of them and the focus will change to be one of having the most Provinces instead of having the correct number. I’ve also found that the game becomes a little locked up when 2 or more players all have enough Provinces for a win, but all have the same amount of Provinces. Who do you help in these times? And if you are the one attacked and you don’t have enough cards to cover for the casualties, what do you offer from your court? Provinces or Lords/Priests? Since the victor cannot place it right away, you find yourself in situation where sacrificing Provinces might just be the right thing to do. With some games under your belt, this game can easily be played as a fast filler during lunchtime, with a playing time of probably under 45 minutes. We were 4 players for Tnka, with Nico, Pascal and Anshul joining me. I’d never met Anshul or Pascal, but I’m glad to say that they were both brilliant players who made the evening fun. After the brief rules explanation, we were off. I took an early lead, having 4 Provinces down within the four first turns, hoping to end the game quickly before anyone would notice. At this point of the game, players mostly concentrated on Samurai and setting up attacks against each other. Nico did one such devastating attack on Pascal in the early goings which badly backfired and was nearly wiped out. While things looked really bad for him, he did recover nicely over the next few turns. Needless to say, I started to get attacked quite often, with Pascal acquiring quite the army and not being afraid of using it. No one ever really kept the advantage of either the Priest or the Lord and their Pitch effect were never really used until near the end of the game, which made for a combat heavy game. As the game devolved, the Stability number kept dropping lower and lower until it reached 3. For almost all of the time it was at 3, we were in a 2 or 3 way lock up, with players being tied at 3 Provinces each and each of us in turn being able to win only to be brought back down by the other 3. Just as it looked like Japan was going to fall into chaos, Pascal finally set himself up with an unassailable army (he was the only one holding cards) and finally plopped down two provinces on the same turn, winning the game. I really liked my first game of this and I already see where I can change the way I played a bit. Pitching cards is a good thing and we did it at the end of the game to great effect, chipping away at the court of some players or claiming cards from their hand. Can’t wait to play this again.